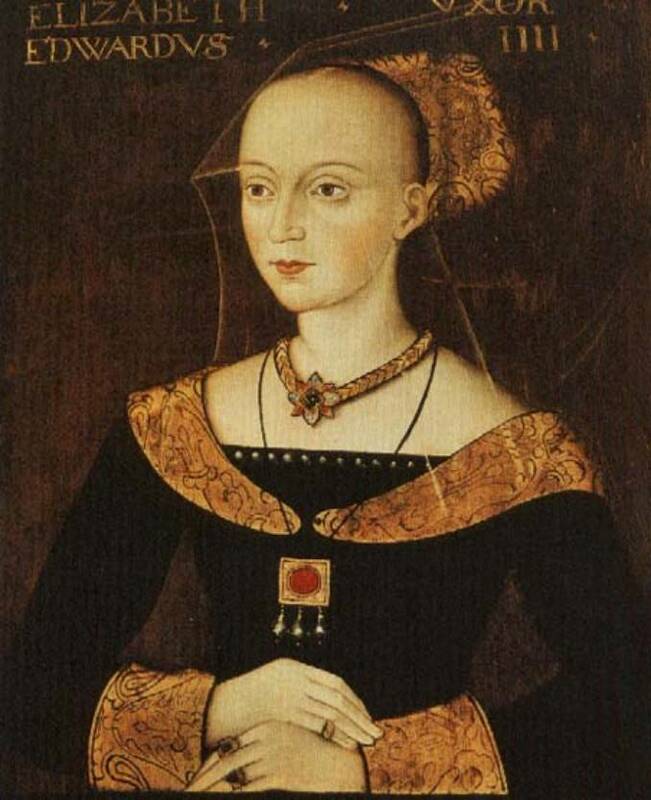 On Friday I posted about contemporary depictions of Elizabeth Woodville. Today, I’d like to share four other documents relating to her. 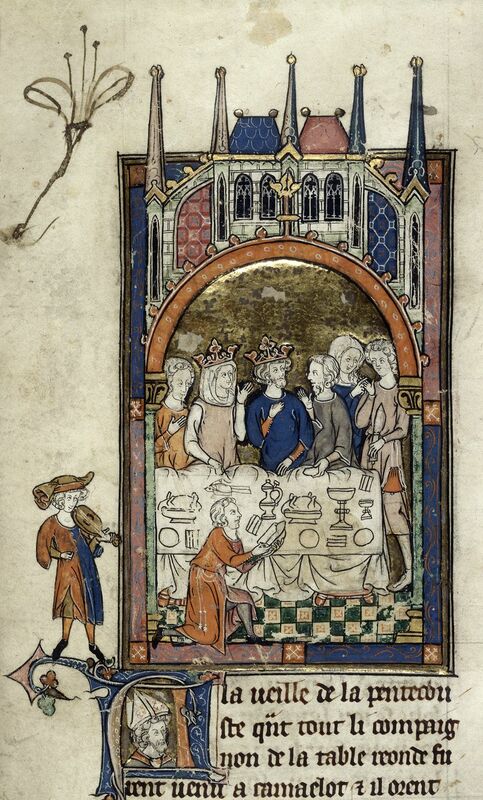 The first, British Library MS Royal 14 E iii, is a fourteenth-century book of Arthurian Romances. Originally owned by Charles V and VI of France, the book passed to John, duke of Bedford (the first husband of Elizabeth’s mother, Jacquetta of Luxembourg) in the early fifteenth century. It was later owned by Sir Richard Roos of Gedney and his niece, Eleanor Haute, who inscribed ‘Thys boke ys myne dame Alyanor Haute’ on folio 162. However, it’s another name, ‘E. Wydevyll’, inscribed just above Eleanor’s that makes this manuscript so interesting. It may refer to Elizabeth’s brother, Edward Woodville, but it could equally be a reference to Elizabeth, perhaps even her autograph, from a time before she was queen. ‘E. Wydevyll’ and Eleanor Haute’s inscription in British Library MS Royal 14 E iii, fol. 162r. The first folio of the book also contains the names of two of Elizabeth’s daughters, ‘Elysbathe the kyngys dowter and Cecyl the kyngys dowter’, providing a clearer connection between the book, the royal household, and the queen. 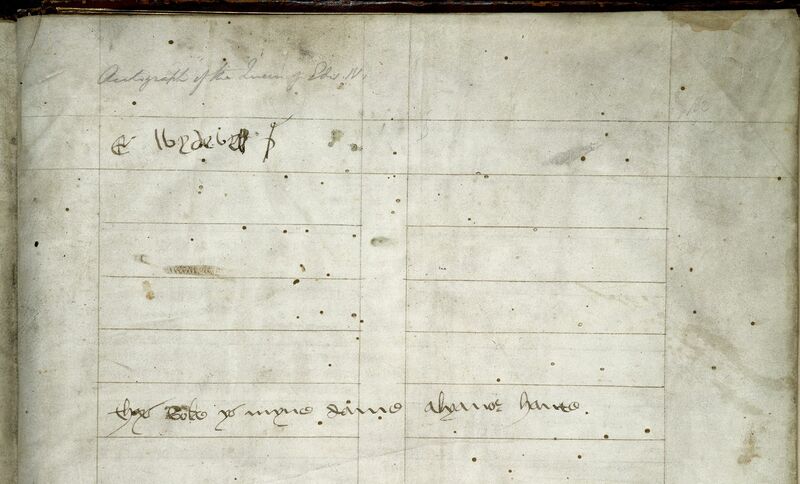 The names of Elizabeth’s daughters ‘Elysbathe and Cecyl’ in British Library MS Royal 14 E iii, fol. 1. Another document that leaves us in no doubt what Elizabeth’s royal signature looked like is a letter from the queen to the Bishop of Lincoln dated 1477. A professional scribe copied the actual letter, but ‘Elysabeth’ signs it at the bottom. Letter from ‘Elysabeth’ to the Bishop of Lincoln, 1477. 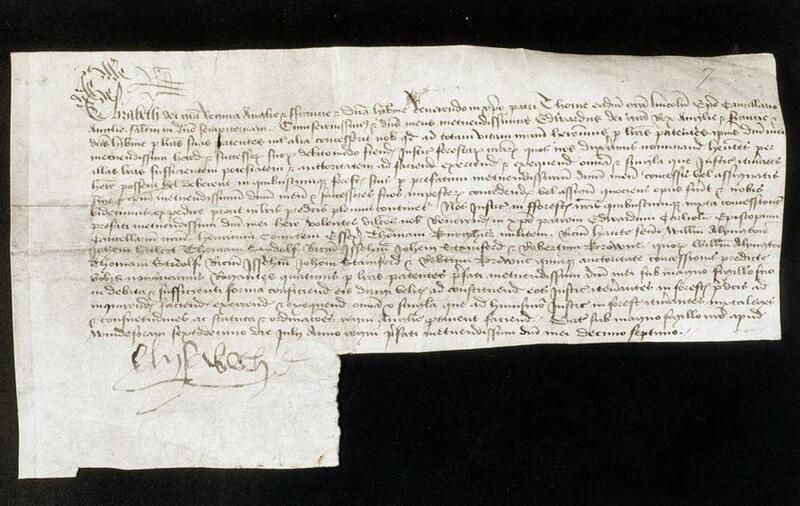 This autograph is almost identical to the one she signs in 1491, confirming receipt of her annuity from Henry VII. ‘In Dei nomine, Amen. The xth daie of Aprill, the yere of our Lord Gode MCCCCLXXXXII. I Elisabeth, by the grace of God Quene of England, late wif to the most victoroiuse Prince of blessed memorie, Edward the Fourth, being of hole mynde, seying the worlde so traunsitorie, and no creature certayne whanne they shall departe frome hence, havyng Almyghty Gode fressh in mynde, in whome is all mercy and grace, bequeath my sowle into his handes, beseechyng him, of the same mercy, to accept it graciously, and oure blessed Lady Quene of comforte, and all the holy company of hevyn, to be good meanes for me. Item, I bequeith my body to be buried with the bodie of my Lord at Windessore, according to the will of my saide Lorde and myne, without pompes entreing or costlie expensis donne thereabought. Item, where I have no wordely goodes to do the Quene’s Grace, my derest doughter, a pleaser with, nether to reward any of my children, according to my hart and mynde, I besech Almyghty Gode to blisse here Grace, with all her noble issue, and with as good hart and mynde as is to me possible, I geve her Grace my blessing, and all the forsaide my children. Item, I will that suche smale stufe and goodes that I have be disposed truly in the contentacion of my dettes and for the helth of my sowle, as farre as they will extende. Item, yf any of my bloode wille any of my saide stufe or goodes to me perteyning, I will that they have the prefermente before any other. And of this my present testament I make and ordeyne myne Executores, that is to sey, John Ingilby, Priour of the Chartourhouse of Shene, William Sutton and Thomas Brente, Doctors. And I besech my said derest doughter, the Queue’s grace, and my sone Thomas, Marques Dorsett, to putte there good willes and help for the performans of this my testamente. In witnesse wherof, to this my present testament I have sett my seale, these witnesses, John Abbot of the monastry of Sainte Saviour of Bermondefley, and Benedictus Cun, Doctor of Fysyk. Yeven the day and yere abovesaid’ [from J. Nichols, A Collection of all the Wills, now known to be extant, of the Kings and Queens of England, pp. 350-51]. Elizabeth died on 8 June 1492. 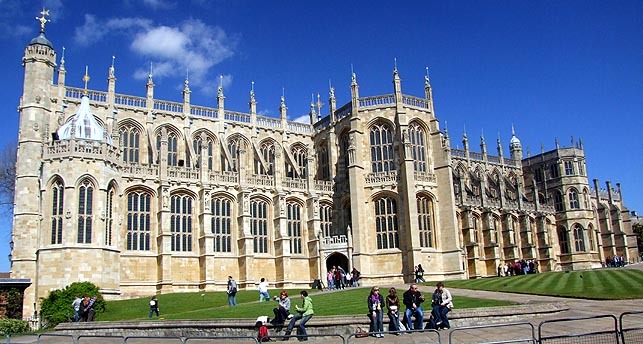 Four days later, she was buried beside Edward IV at St George’s Chapel, Windsor. This entry was posted in The Parchment Mirror and tagged Arthurian Romance, BBC, BBC white queen, Bermondsey Abbey, Cecily of York, Charles V of France, Charles VI of France, Edward IV of England, Edward Woodville, Eleanor Haute, Elizabeth of York, Elizabeth Woodville, expert, Henry VII, historical consultant, Jacquetta of Luxembourg, John duke of Bedford, John of Lancaster, medieval expert, medieval queens, medieval queens expert, Middle Ages, philippa gregory, Queen Elizabeth, queen's will, Richard III, richard III expert, RIchard Roos, royal 14 e iii, Signature Woodville, St George's chapel, Wars of the Roses, White Queen on June 23, 2013 by Sarah Peverley. The BBC’s new drama series The White Queen began on Sunday. Based on the Cousins’ War novels by Philippa Gregory, the series focuses on Elizabeth Woodville, Edward IV’s queen, who rose to power during a turbulent period of civil war in England known as The Wars of the Roses. 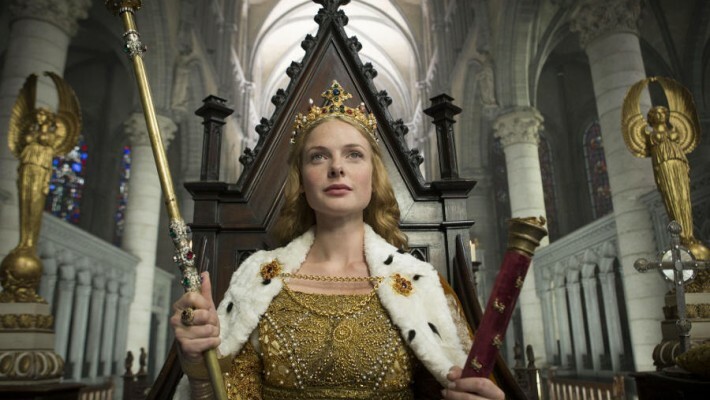 The coronation of Elizabeth (Rebecca Ferguson) in the BBC’s The White Queen. As a medievalist who specialises in this period, I’m delighted that the real life ‘Game of Thrones’ is finally taking attention away from the ever-popular Tudors. 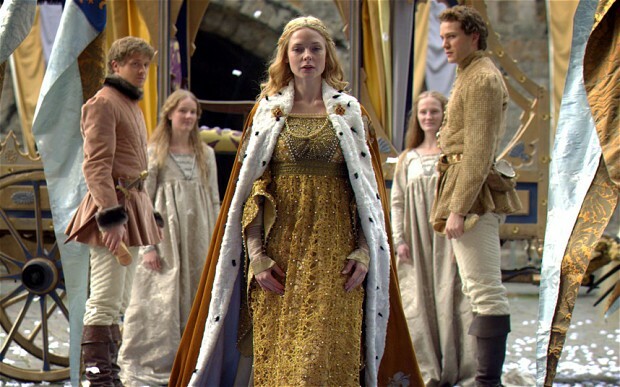 Sure, the TV series takes liberties with characterisation and plot – it isn’t for purists who want to learn the facts of the period, see historically accurate clothing, or discover how real medieval people spoke and thought – but it’s a way into some of the complex power relations, family ties and events that typified late fifteenth-century England. This post is for those wanting to know more about what the real White Queen might have looked like and what she wore in contemporary, or near contemporary, images. Portrait of Elizabeth at Queen’s College Cambridge. 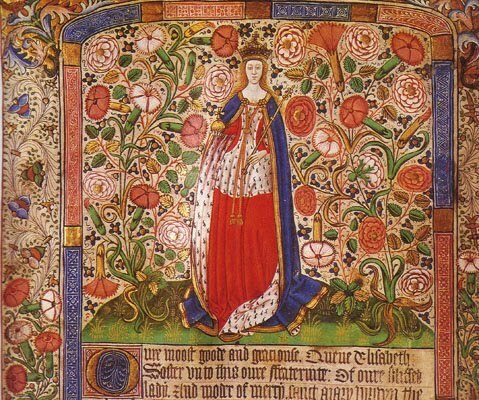 The image of Elizabeth most commonly seen in books and online is that above, one of the three painted panels of her at Queen’s College Cambridge. In the painting, Elizabeth wears a black gown with patterned gold collar and cuffs. The style of her gown is typical of English dresses circa 1475-85. Commonly referred to as a ‘transitional’ dress, it bridges the gap between the V neck Burgundian gowns of the mid to late fifteenth-century and the square-necked early Tudor gowns. The shape of the wide collar is rounded, and it fits over a tight bodice. Her sleeves are tight-fitting with turned back cuffs. 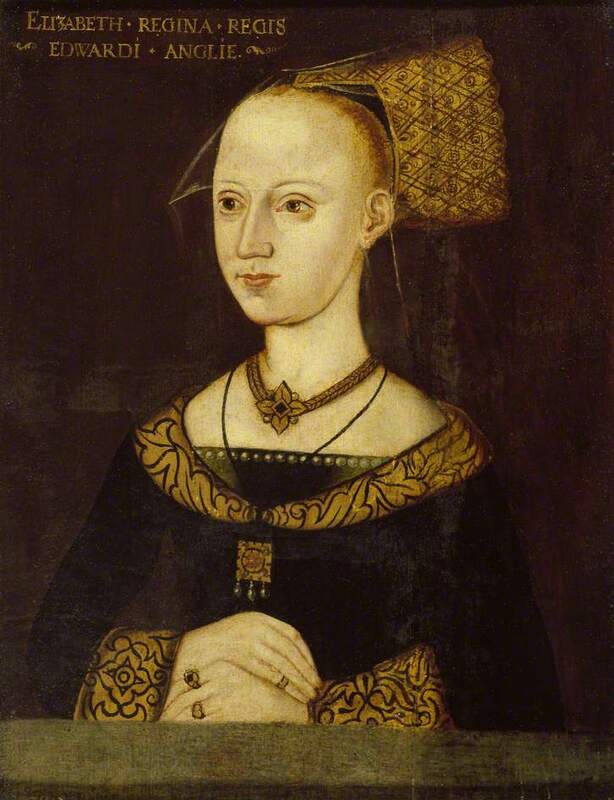 Elizabeth has a fashionably high forehead (thought to be beautiful in the Middle Ages) and her hair is pulled back and covered by a truncated henin and cointoise (veil). What looks like an extension of the veil beyond the back of the henin perhaps suggests that it is a butterfly henin, which had structured wires extending from either side to lift the veil higher. Portrait of Elizabeth. Queen’s College, Cambridge. Portrait of Elizabeth from the Royal Collection, Windsor. Portrait of Elizabeth in the Ashmolean Museum, c. 1500. Almost all of the other oil panel paintings of Elizabeth are based on the same image and derive from the sixteenth century, but there are some beautiful contemporary images of the queen in late fifteenth-century manuscripts and stained glass. In the window of Little Malvern Priory, Elizabeth is shown kneeling in prayer with her family. She wears a blue, fur-collared Burgundian gown with a deep V neck, revealing a golden kirtle and white partlet; accompanying the gown she has a red, ermine trimmed cloak, and a heart-shaped, or horned, headdress, with a padded roll and decorative jewel, matching the decoration on the lectern. A similar image occurs in Canterbury Cathedral (below). 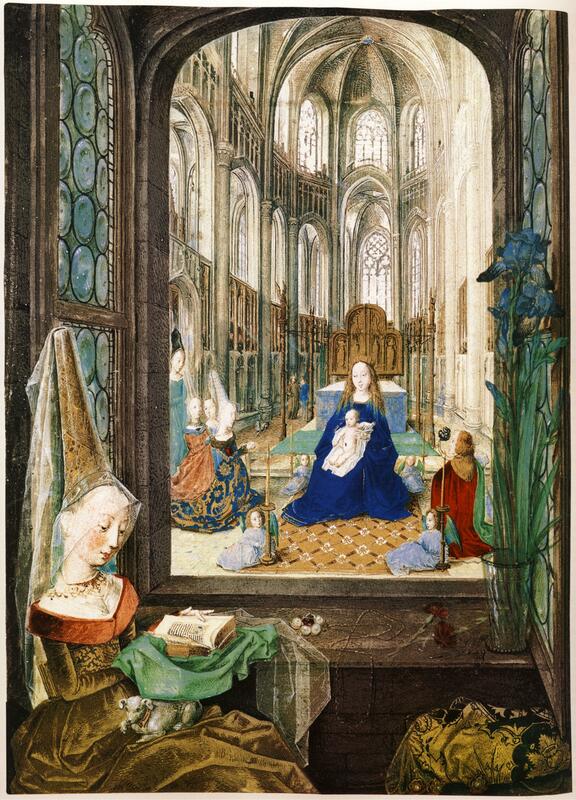 The pious Elizabeth is shown praying opposite her husband, Edward IV, with their children behind them. Her attire is different to that in Little Malvern Priory: here she is crowned and wearing a white and gold patterned gown symbolising purity beneath her purple cloak. A rosary and cross hang down from her belt. 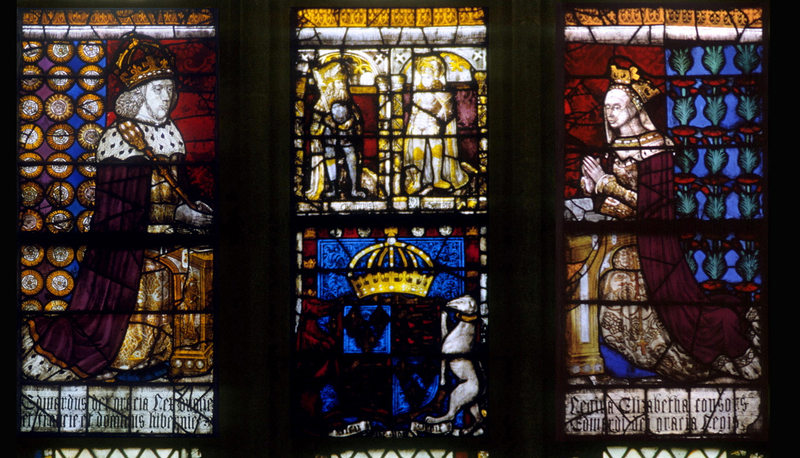 Edward IV and Elizabeth in the Royal Window, Canterbury Cathedral. The Luton Guild Book contains another pious image of the royal family, kneeling before Bishop Thomas Rotherham and the Trinity. Elizabeth wears a blue and gold Burgundian gown, with a brown fur collar, partlet, deep green girdle (belt), a purple and ermine trimmed cloak, and a black hood. The women behind her sport butterfly henins. The Luton Guild Book. Frontspiece, circa 1475. The purple cloaks in the last two images seem to nod to Elizabeth’s coronation attire, which William Ballard, a fifteenth-century herald, describes as ‘a mantyll of purpull’, that she later exchanges for a ‘surcote of purpull’. 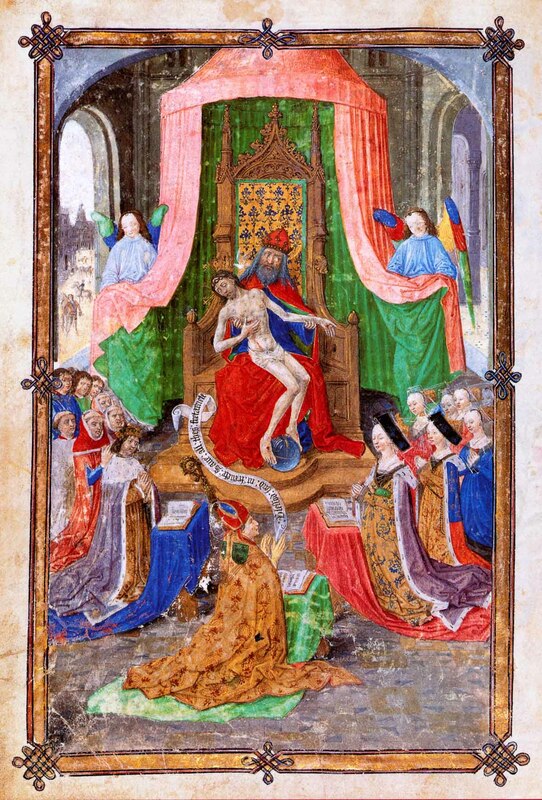 She is also shown wearing purple in a miniature in Lambeth Palace MS 265, which shows her brother Anthony Woodville, second earl Rivers, presenting a book to the royal family. 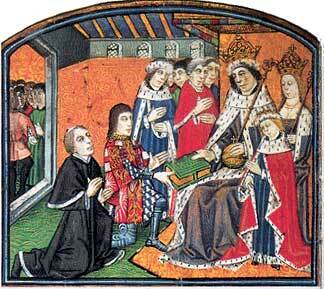 Anthony Woodville presents a book to Edward IV, Elizabeth and Prince Edward. Lambeth Palace MS 265. One of the most striking images of Elizabeth is in the Worshipful Company of Skinners’ Fraternity of Our Lady’s Assumption Book, which shows her in a stunning red and ermine trimmed surcoat, and a blue cloak trimmed with gold. 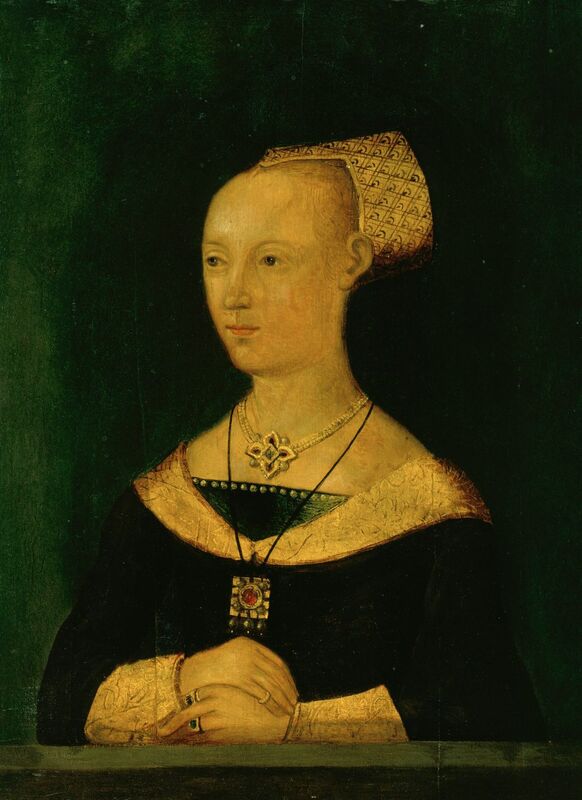 As Joanne Laynesmith (née Chamberlayne) has discussed in her work on Elizabeth, medieval queens were traditionally virgins, so Elizabeth’s status as a mother and widow was deeply problematic. Whoever commissioned the image was clearly trying to address her unconventional status and align her with representations of the Virgin Mary: the ideal mother. 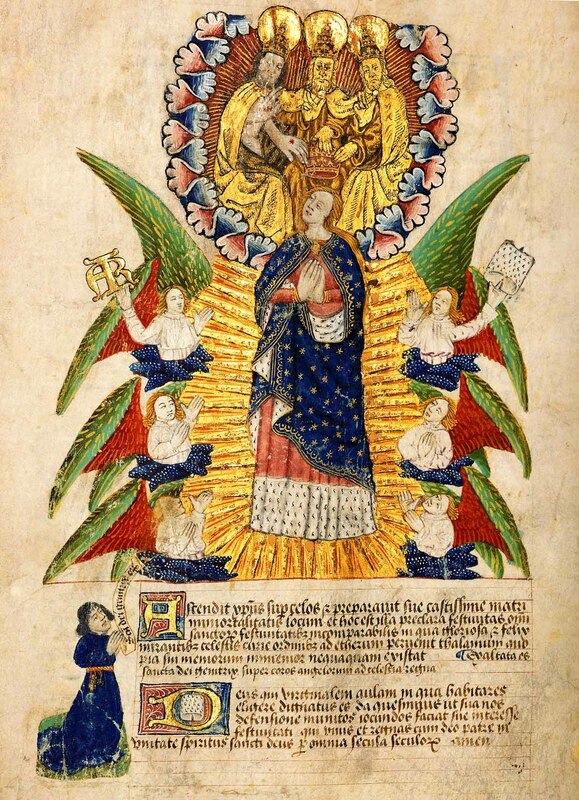 Elizabeth’s hair is loose (a common way of depicting virgins, especially Mary), she wears a blue cloak associated with purity, and holds an orb and sceptre, just as Mary does in images presenting her as the Queen of Heaven. 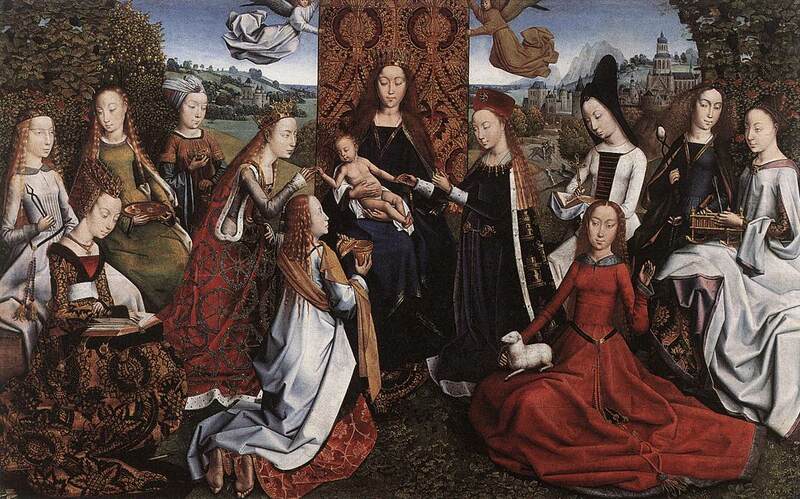 By constructing Elizabeth’s motherhood in ‘strikingly Marian terms’, the artist distances her ‘from ordinary women’. Coronation of the Virgin (loose hair and gown similar to Queen Elizabeth’s). Worshipful Company of Skinners’ Book. Elizabeth wears the same outfit, minus the gold trim on the cloak, and has the same loose hair in one of my favourite manuscripts: Liverpool Cathedral Manuscript Radcliffe 6. Containing the Hours of the Guardian Angel, and still in its original textile binding, this incredible little book has an extremely rare miniature of a presentation scene between two women. The woman presenting the book, almost certainly Joan Luyt, presents the golden Guardian Hours to the queen ‘with euerlastyng ioy’. Liverpool Cathedral MS Radcliffe 6, Hours of the Guardian Angel. Joan Luyt presents the book to Elizabeth Woodville. Though Elizabeth’s secret marriage to Edward IV caused great controversy in the 1460s because she fell short of the traditional standard of being an unmarried virgin of considerable status, we would not know this from contemporary depictions of her. The legacy left by the artists that immortalised her in painted glass, parchment and panels, is of a beautiful, powerful and pious individual, who could fulfil the role of mother to all Englishmen. 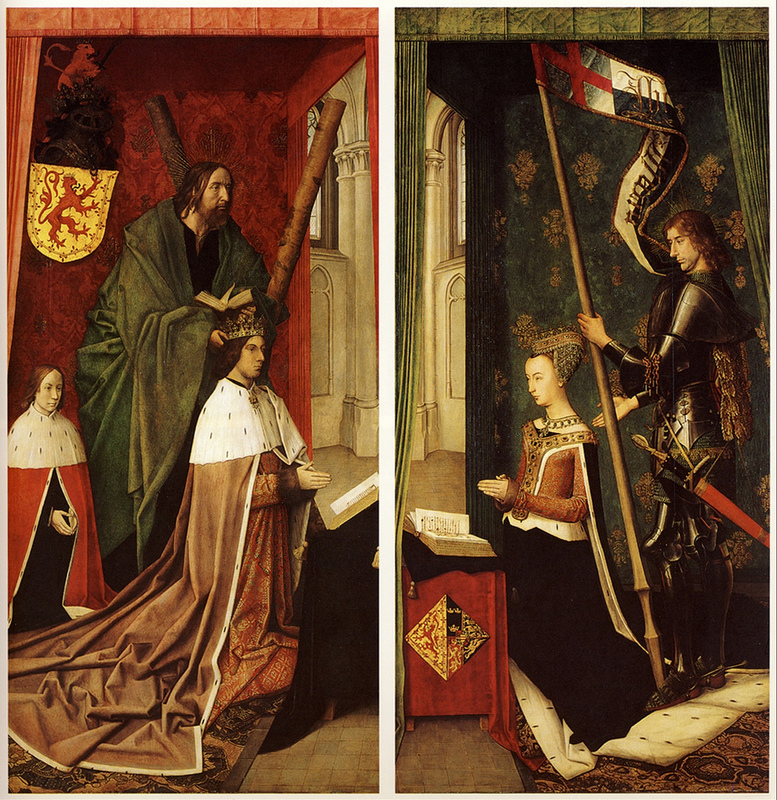 While these images clearly convey an ideal, it’s worth remembering how medieval artists pictured Edward’s bride the next time The White Queen distracts us with inaccurate necklines and zips! This entry was posted in The Parchment Mirror and tagged Anthony Woodville, BBC, BBC white queen, Canterbury Cathedral, civil war, coronation of virgin, coronation robes, Cousins' War, Earl Rivers, Edward IV, Elizabeth, Elizabeth Woodville, english coronations, english queens, expert, fifteenth century england, fifteenth century expert, historical consultant, Hours of the Guardian Angel, Joan Luyt, Little Malvern priory, Liverpool Cathedral Radcliffe 6, Luton Guild Book, Mary, medieval book presentation, medieval books, medieval coronation, medieval dress, Medieval England, medieval expert, medieval fashion, medieval queens, medieval queens expert, Middle Ages, philippa gregory, Queens College Cambridge, queens middle ages, Richard III, richard III expert, royal portraits, Skinners' Company, stained glass, Starz, Wars of the Roses, White Queen, yorkists on June 18, 2013 by Sarah Peverley. 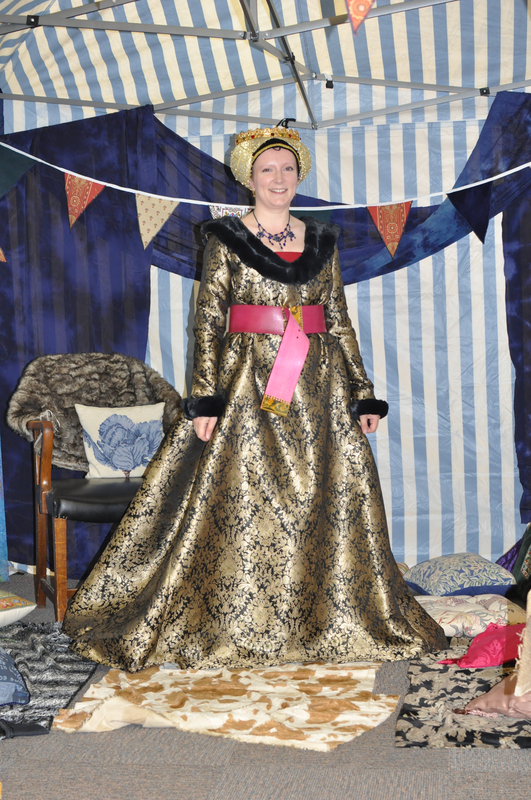 A few months ago I commissioned a replica late fifteenth-century Burgundian gown to wear for my medieval storytelling session at Lancashire Archive’s ‘Medieval Day’. Popular throughout Northern Europe for roughly five decades, the Burgundian gown is a layered outfit (an ‘A-line’ shaped gown worn over the top of a tight-fitting kirtle and chemise), which evolved from its loose-fitting predecessor the houppelande. 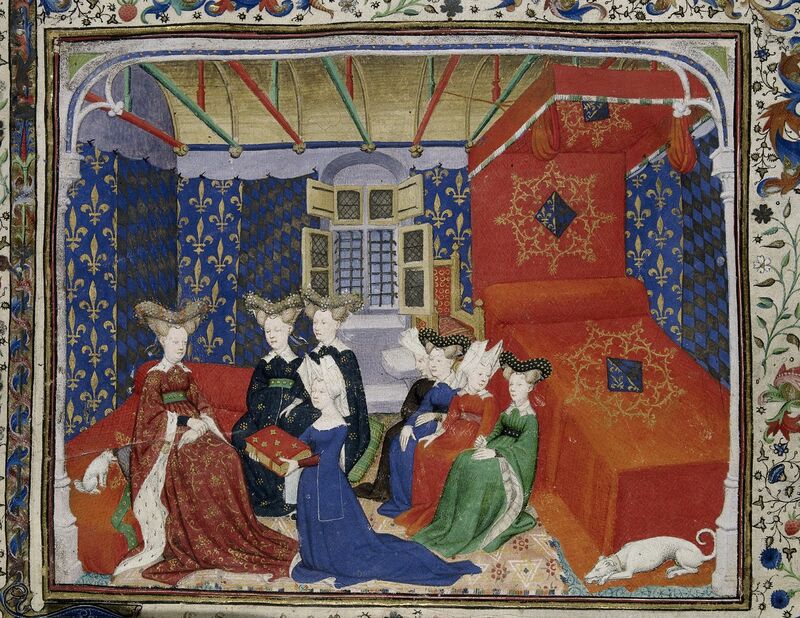 Isabeau of Bavaria and her ladies in waiting wearing wide-sleeved houppelandes in British Library MS Harley 4431. The houppelande was a sumptuously weighty gown, lined with fur, worn over a slim fitting cotehardie and chemise. By the early fifteenth century it had developed a long train, large turned-back collar and lavishly long sleeves. In the 1440s the sleeves started to become tighter again and, as the century moved on, they became the slim-fitted sleeves of the burgundian gown, with fur or fabric bell-shaped cuffs that could be turned back. The collar of the houppelande similarly evolved, dropping down further and wider, until it became the V-neck shape of the burgundian gown. Other changes included the gradual introduction of a deeper belt, or girdle, to draw in the loose-fitting skirt, creating a more slender waist line. 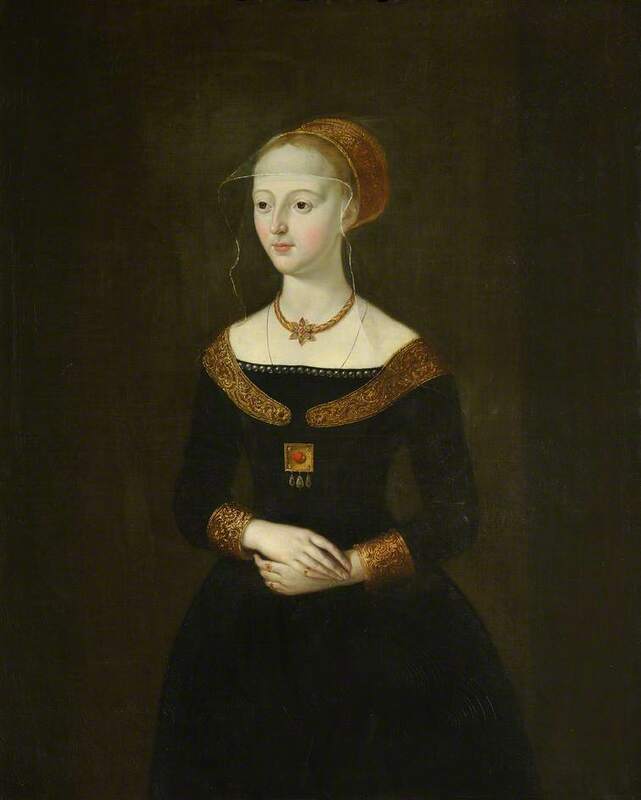 By the end of the century the top of the dress had become so fitted that such a large belt was no longer needed and ladies (by this time Tudor ladies) wore thinner, decorative belts. For late fifteenth-century inspiration, I turned to my favourite images of the gowns from medieval art and manuscripts: a depiction of Saint Ursula in the Master of Lucy Legend’s painting of the Virgin surrounded by female saints (circa 1488); two images of Mary of Burgundy in Mary of Burgundy’s Book of Hours (circa 1477); a painted panel circa 1480 depicting Saint Catherine converting the scholars (Walters Art Museum 37.2487); and The Whore of Babylon in Pierpont Morgan MS M. 68. St Ursula’s black and gold Burgundian gown (bottom left). Master of Lucy Legend. Virgin and Saints. 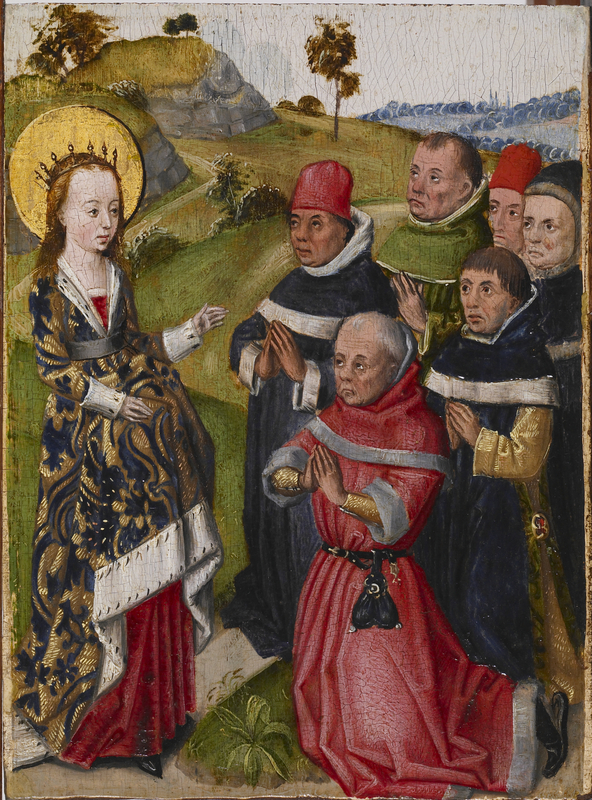 Mary of Burgundy (in foreground and background praying to the Virgin). 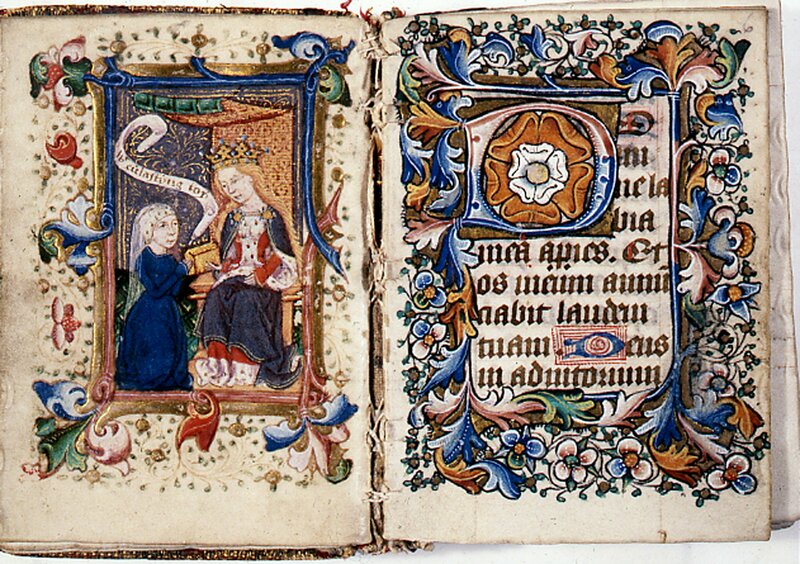 Mary of Burgundy’s Hours. 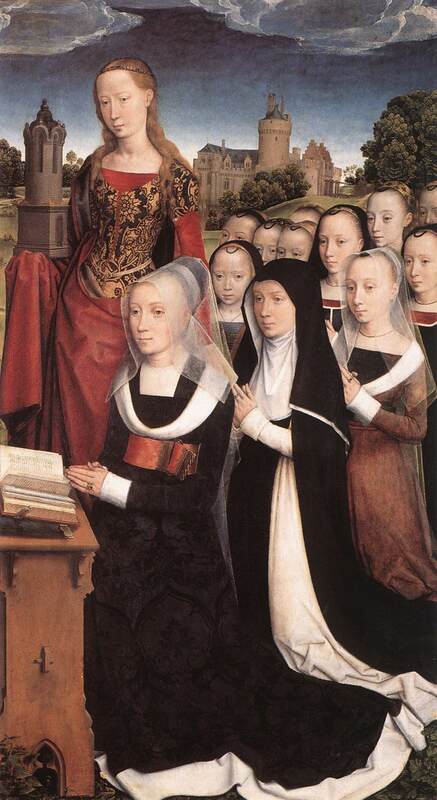 Saint Catherine converting the Scholars. Walters Art Museum 37.2487. 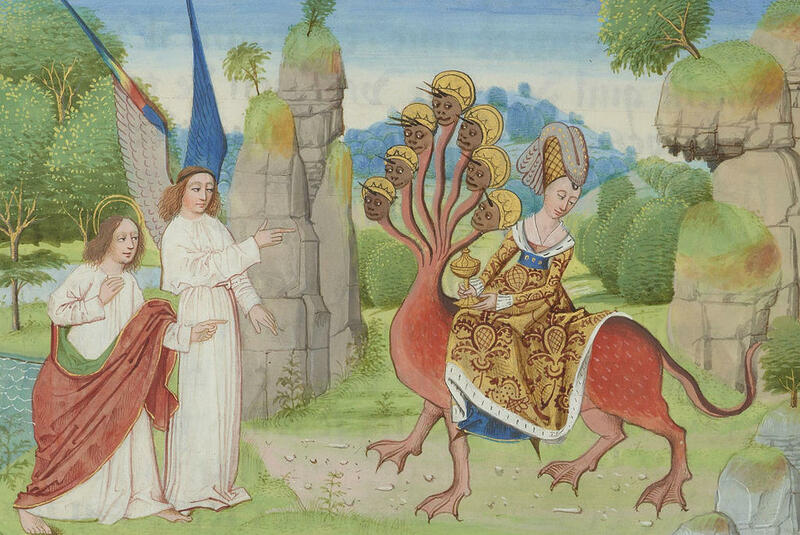 The Whore of Babylon. Apocalypse of Charles the Bold; Belgium, Bruges, circa 1470. Pierpont Morgan MS M.68. After much deliberation, I opted for the black and gold gown worn by Saint Ursula, with a red kirtle, like those worn beneath Ursula’s and Catherine’s gowns. The neckline of Mary of Burgundy’s gown is deeply cut and her kirtle (assuming she has one) can’t be seen, instead she has a transparent partlet, that can just be made out above the neckline of the dress. Made out of wool or linen (or both), late medieval kirtles are most commonly seen in red, blue, green or (for the very wealthy) cloth of gold. To complete the outfit, I needed a headdress of some kind. The steeple henin worn by Mary of Burgundy is probably the most commonly known medieval headdress (think – somewhat incorrectly – pointy princess hat), but henins depicted in English sources of the late fifteenth century tend to be the truncated or butterfly designs. 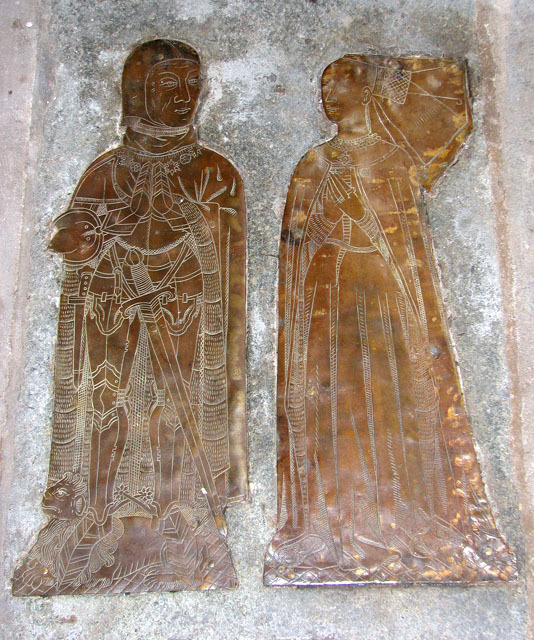 Memorial brass for William Yelverton and his wife, who wears a butterfly henin. St Mary’s Church, Rougham, Norfolk, 1472. Covered by a veil or cointoise, that often continued down over the woman’s face or forehead, the henin was designed to show off a high forehead (considered so attractive that women plucked or shaved their hair back to exaggerate it). Most depictions of henins and other headdresses show a short loop that appears to have been attached to a headband that helped to keep the headdress in place or adjust it. Panel of a triptych showing the Moreel Family by Hans Memling (1484). Barbara Moreel wears a truncated henin and cointoise (and red girdle), while the girls behind her wear headbands with loops. 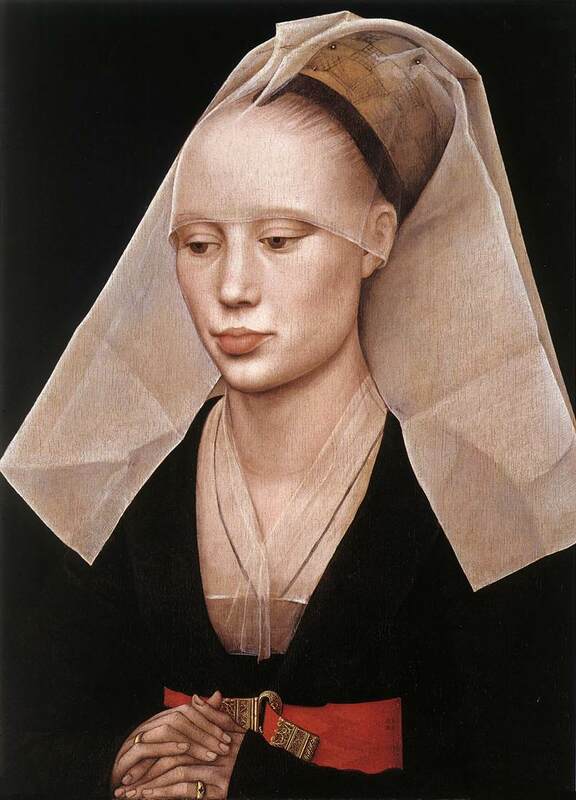 In the end, I opted for a reticulated headdress similar to the one worn by Saint Ursula and by Margaret of Denmark, Queen of Scotland, in an altarpiece by Hugo van der Goes (circa 1482). A deep red belt, with an elaborate brass D-Shaped buckle, like those worn by Barbara Moreel and Van der Weyden’s ‘Lady’, completed the gown. The finished gown and headdress, expertly crafted by Alexis at Decosa Design, and the beautiful belt by Bayley Heritage Castings are pictured below. My late fifteenth-century Burgundian gown, with red kirtle and reticulated headdress. 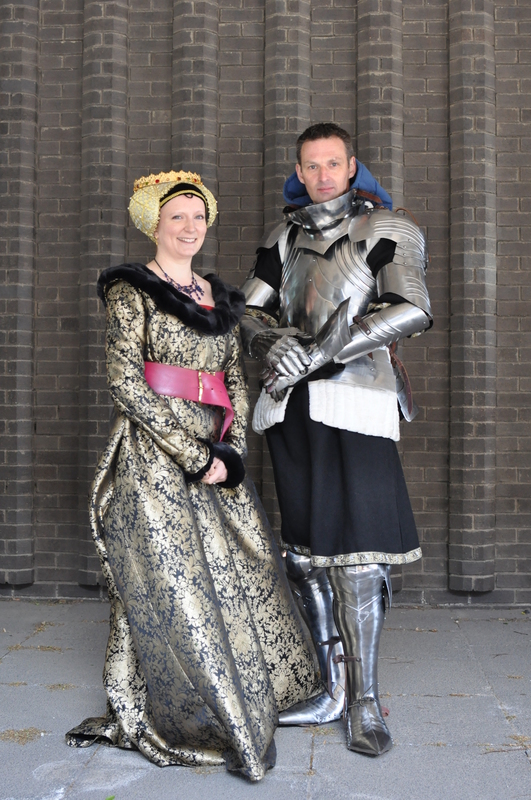 One of the King’s Men and I at Lancashire Archive ‘Medieval Day’. This entry was posted in The Parchment Mirror and tagged Barbara Moreel, Bayley Heritage Castings, Burgundian dress, Burgundian gown, Charles Bold Apocalypse, Decosa Design, fifteenth century dress, henin, houppelande, kirtle, Lancashire Archive, Margaret of Denmark, Mary of Burgundy, Master of Lucy Legend, medieval girdle, reticulated headdress, Saint Catherine, Saint Ursula, Van der Weyden, Walters Art Museum, Whore of Babylon on June 15, 2013 by Sarah Peverley.